These days, it’s all too easy to find examples of “Big Data” making an impact. From solving crimes to fighting diseases, hiring efficient workforces to winning elections, and tailoring consumer entertainment choices to developing unsettlingly well-targeted ads, data science has expanded its reach into every industry. Harvard Business Review has pegged data analytics as “the sexiest job in the 21st century,” and it’s not alone – experts in the private sector, social sector, and academia agree that proficiency with Big Data has gone from a luxury to a requirement in all fields. Yet as any data scientist will tell you, data is meaningless without quality analysis. In fact, because of the unprecedented quantities of data that are now being produced every day, analyses are at once becoming increasingly complex and increasingly critical. The size of your hard drive, in other words, is irrelevant – what matters is how you interpret and present the information it contains. This is precisely the challenge for many nonprofits with limited resources: how can they hope to compete with the sky-high salaries that private sector corporations are offering data science experts? We have a different sort of solution in mind – one that harnesses the untapped potential of students. As institutions of higher education dramatically expand their data science offerings, countless students are gaining new skills, but aren’t putting them to use with real-world datasets. Next month, we’re giving tens of thousands of those students from around the world the chance to do something more exciting: work with your data to strengthen your impact. Nonprofits of all types are now invited to apply to “Introduction to Data Science,” a massively open online course to be taught next month by Prof. Bill Howe of the University of Washington. As part of the course, students will have the option to complete a project in which they work with a real dataset to address the needs of an organization. As they learn techniques in data visualization and trend identification, these students will apply what they learn to help drive your organization’s future initiatives. The insights they offer could strengthen your impact and identify areas for growth. In a world with limited resources, it just makes sense to utilize student talents and creativity to strengthen your work. Tens of thousands of students have already registered for the course – don’t miss your chance to recruit their help for free. 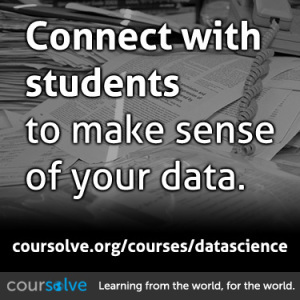 To read more and sign up, visit http://coursolve.org/courses/datascience. 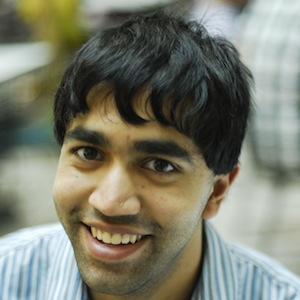 Amit Jain is the lead researcher and marketing director at Coursolve, which connects academic courses to organizations to empower students to solve real-world problems. He is also an associate teacher of middle school math and science at a charter school in Boston, MA.